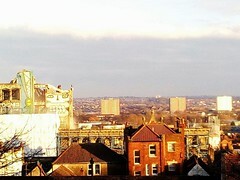 In the Spring 2012, Bristol City Council will prepare a ‘development brief’ for the site, drawing on this Community Vision. Later in 2012 the development brief will be used to invite interest from a wide range of developers so that one can be selected who will best respond to the Vision. The selection process will involve representatives of the Action Group and the City Council. The selected developer will take the scheme forward in partnership with the Council and the local community. This will include purchase of the site if necessary using compulsory purchase powers. It is recognised that any redevelopment of the site is likely to take some years. The site is currently owned by Comer Homes. In 2011 they submitted a planning application to build 183 flats on the site together with shops and parking; a scheme which has significant differences to our Vision. If their application is successful they could progress with the development. Nevertheless we hope that they will amend their scheme and work with the community to help deliver our Vision. Ongoing updates together with information from the consultation process can be found on our website, http://www.carriageworks.org.uk, where you can also leave comments and sign up to our email newsletter.